Ocala Breeder’s Feed and Supply has longstanding relationships with suppliers that know and understand our expectations in hay quality. We take pride in providing consistent top-quality hay year-round. In need of hay cubes? 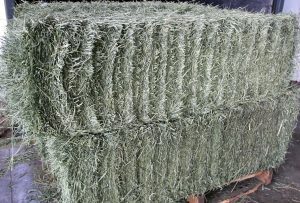 We also carry Stampede Premium Hay Cubes. Peak harvested and naturally sun-cured these cubes offer maximum palatability, performance and nutrition. With guaranteed ingredient analysis, Stampede cubes are consistent in quality all seasons and are easily stored. Cubes assure horse owners little waste and an accurate calculation of how much hay fiber each horse is receiving. We offer compressed, kiln-dried shavings in several sizes. Shavings being kiln-dried removes all excess moisture that may add unwanted irritants such as mold. Our shavings are also rigorously screened to eliminate dust particles. Cedar shavings are available in smaller sizes for small pet and animal creates and cages. Ocala Breeders’ Feed and Supply offers an all-natural biodegradable pelleted bedding. Known to provide cleaners, healthier stalls these pellets remove waste; saving on removal cost. Just one bag will absorb 22 gallons of water.